primary synchronous bilateral breast cancer. Background: Primary synchronous bilateral breast cancer (PSBBC) is a rare clinical entity. The reported incidence ranges between 0.3% and 12%. There are several controversial issues regarding PSBBC pertaining to the diagnostic criteria, nomenclature, and management policies. Materials and Methods: Fourteen cases of PSBBC treated between 2001 to 2010 at our institute were retrospectively analysed in regards to demographic data, management and follow up. Results: PSBBC constituted 0.19% of total breast cancer patients at our institute. Age ranged from 28 to 78 years. PSBBC were detected by clinical examination in eight cases and by mammography in six cases. Twelve patients underwent bilateral modified radical mastectomy, one had unilateral mastectomy on one side and breast conservation on the other side and one patient has bilateral breast conservation. Majority of patients belonged to stage 2 and stage 3. All patients were found to have invasive ductal carcinoma. Five cases were ER/PR positive and 8 patients were triple hormone receptor negative. Eight patients received unilateral and six received bilateral adjuvant radiotherapy. Nine patients received adjuvant chemotherapy. 5 patients received adjuvant hormonal therapy. Median follow up of patients was 15.4 months. Conclusion: PSBBC is a rare event warranting awareness and screening of the contralateral breast in patients with unilateral breast cancer. These patients require individualized treatment planning based on the tumor factors of the index lesion. Further multi institutional prospective studies are needed for adequate understanding of management of PSBBC. Keywords: Bilateral breast cancer, clinicopathology of primary synchronous bilateral breast cancer, primary synchronous bilateral breast cancer. Unlike unilateral breast cancer there are no clear treatment guidelines for PSBBC. There are several controversial issues regarding PSBBC pertaining to the diagnostic criteria and management policies. To address these issues, a retrospective analysis of bilateral breast cancer patients was performed at our institution and the clinical profile, treatment patterns and outcome of patients were analyzed. Between January 2001 and December 2010, 14 patients with primary synchronous bilateral breast carcinoma were treated at our institution. The characteristics of these patients were retrieved from the case records. Patients with PSBBC were defined as having a contralateral tumor diagnosed simultaneously or within 1 year of the initial diagnosis in the contralateral breast. Data recorded included family history, surgical techniques used, tumor stage and grade, estrogen (ER) and progesterone receptor (PR) status, HER- 2 expression, neoadjuvant and adjuvant treatment and follow up. FNAC was used for confirmation of diagnosis in all cases. Metastatic work up included chest X-ray, abdomen and pelvis and bone scan in all cases. WHO criteria was used for histologic classification. Primary synchronous bilateral breast cancer constituted around 0.19% of all breast cancer cases (7328 cases) treated between 2001 to 2010 at our institute. Age of patients ranged from 28 to 78 years with mean age being 40 years. Two patients were pre menopausal while 12 patients were post menopausal. Three cases (21%) had a positive family history for breast carcinoma in the form of first- degree relative. Eight cases of contralateral breast cancers were detected by clinical examination and six cases were detected with mammography. Thus all 14 of our patients were detected to have bilateral breast cancer either during first clinical examination or during work up of contralateral breast. Three patients received neoadjuvant chemotherapy in the form of epirubicin (100 mg/m 2 ) and cyclophosphamide (1000 mg/m 2 ). Twelve of our patients underwent modified radical mastectomy, one had unilateral mastectomy on one side and breast conservation on the other side and one patient had bilateral breast conservation. All our patients were found to have invasive ductal carcinoma (100%) and none had lobular carcinoma. None of our patients had features of either ductal carcinoma in situ or lobular carcinoma in situ. Majority of our patients were found to have stage 2 or 3 disease. Most of our patients had grade 3 disease. Estrogen and progesterone receptor positivity was seen in 35% and triple receptor negativity was seen in 55% patients. 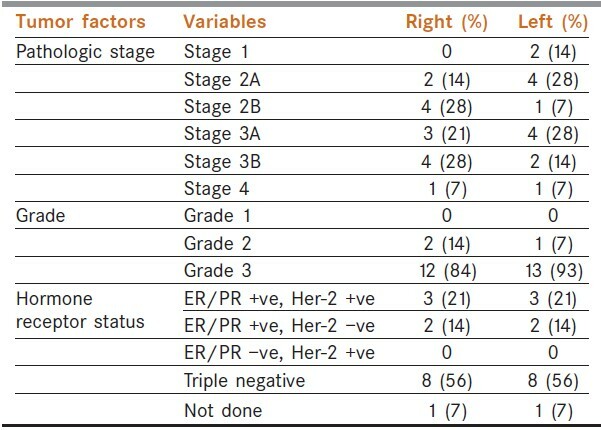 Comparison of T, N and M status between the two tumors is shown in [Table 1] and Stage grouping, Grade and Hormone receptor status is shown in [Table 2]. Six patients received bilateral adjuvant radiotherapy with a dose of 45 Gy (25 fr), eight patients received unilateral radiotherapy with a dose of 45 Gy (25 fr), and nine patients received adjuvant chemotherapy in the form of epirubicin (100 mg/m 2 ) and cyclophospamide (1000 mg/m 2 ). Tamoxifen (20 mg) was used for ER/PR + ve patients (5 pts) as adjuvant hormone therapy Adjuvant treatment is shown in [Table 3]. At a median follow up of 15.4 months (2-27 months), 13 (92%) patients were disease free and one (7%) patient had disease relapse in the form of chest wall recurrence which was treated with surgery. Primary synchronous bilateral breast tumors are thought to be independent tumors rather than secondary to metastatic spread from one of the primary lesions. Characteristics, which imply independent tumors are the presence of an intra-ductal component, different histologies or different degrees of differentiation between the tumors. In the largest prospective study to date of 143 patients with SBBC, the strongest correlation of an intra-ductal component between the bilateral breast tumors implies independent tumors and excludes the metastatic origin of these tumors. In a study of the chromosomal abnormalities in patients with bilateral breast cancers, the majority of contralateral tumors arose independently of the primary tumor. An alternate explanation for these similar clonal abnormalities is a single-cell origin or exogenous or endogenous influences affecting both breasts simultaneously. However, in our study, the rate of pathologic and hormonal sensitivity concordance was 100%. This may be due to smaller number of patients. It is estimated that 5 to 10% of all breast cancers are hereditary, half of which are related to a germ-line mutation in BRCA1 or BRCA2. Women with BRCA mutations are at risk for bilateral breast cancer, and bilateral disease increases the likelihood of identifying a mutation. In our study three cases (21%) had a positive family history for breast carcinoma in the form of first-degree relative.Genetic testing for BRCA1 or BRCA2 was not done in our study. Considerable controversy exists regarding the surgical management of patients with primary synchronous bilateral breast cancer. Traditionally, most clinicians have approached bilateral breast cancer more aggressively than unilateral disease. Most studies have shown a disproportionately higher incidence of bilateral modified radical mastectomy for bilateral breast cancer. This aggressive approach was employed to treat what was once thought to be a disease with a worse prognosis and outcome. However, several studies have shown that the prognosis of patients with bilateral breast cancer seems similar to unilateral disease. Gollamudi et al. retrospectively reviewed patients with PSBBC and showed that they do not have a worse prognosis and can be safely treated with bilateral breast conservation. The cosmetic outcome was comparable to patients who underwent unilateral breast conservation. Heron et al. also demonstrated that bilateral breast conservation treatment does not compromise cosmesis, outcome or overall survival in this group of patients. Currently, the overall consensus is that bilateral breast cancer is amenable to bilateral breast conservation treatment without compromising survival and maintaining patient cosmesis. As for unilateral disease, the most common histologic subtype in PSBBC is infiltrating ductal carcinoma; however, the incidence of invasive lobular carcinoma and the finding of lobular carcinoma in situ (LCIS) is slightly higher amongst PSBBC as compared to unilateral disease. Histologically all our patients were found to have invasive ductal carcinoma (100%) and none had lobular carcinoma or in-situ carcinoma. However, in our study estrogen and progesterone receptor positivity was seen in 35% and triple receptor negativity was seen in 55% patients. This may be due to small number of patients. Protocols for adjuvant treatment in PSBBC have been extrapolated from those used in unilateral disease. The same were used in our patients. Survival data has been difficult to interpret because of different definitions used to describe bilateral breast cancers. Calculations of survival from the time of the first and not the second primary can have a significant impact on the reported survival rates. There is also a question of multi focality and multi centricity associated with these tumors affecting local recurrence rates. 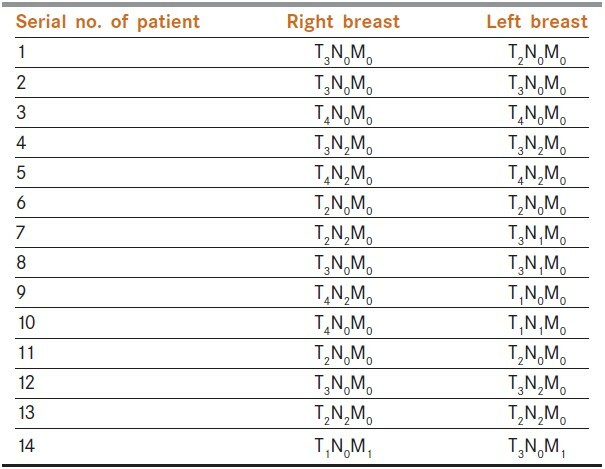 In a prospective study of SBBC, 18% of the bilateral breast cancer patients had the presence of multi focality on both sides. Similarly, others have evaluated breast tumors for multi centricity and found that the presence of multi centric tumors was a significant risk factor for bilateral breast cancer. This higher incidence of multifocal or multi centric disease may explain the slightly higher local recurrence seen after breast conserving surgery. Multi centric or multi focal disease was not seen in our patients. The limitations of this study included the small sample, single institute experience and retrospective data. The data presented in this retrospective study is not appropriate to draw any definitive conclusions. Primary synchronous bilateral breast cancer, though a rare event warrants awareness and screening of the contralateral breast in patients with unilateral breast cancer. The etiology of bilateral breast cancer is uncertain, but most evidence supports independent tumors rather than metastatic spread from the primary tumor. Most present with advanced stage and most of them are triple hormone receptor negative. Though treatment strategies are extrapolated from guidelines for treatment of unilateral breast cancer, these patients require individualized treatment based on the tumor factors of the index lesion. Further multi institutional, prospective studies with longer follow up are needed for better understanding of management of PSBBC. Kelmendi de Ustaran J, Meiss RP. Primary synchronous bilateral breast cancer: Epidemiological approach. Breast Cancer Res Treat 1988;12:311-4. Dawson PJ, Maloney T, Gimotty P, Juneau P, Ownby H, Wolman SR. Bilateral breast cancer: One disease or two?. Breast Cancer Res Treat 1991;19:233-44. Deo SV, Shridhar D, Purkayastha J, Bhutani M, Shukla NK, Raina V, et al. Therapeutic controversies in bilateral breast cancer. Clin Oncol 2003;15:297-8. Tulusan AH, Ronay G, Egger H, Willgeroth F. A contribution to the natural history of breast cancer. Bilateral primary breast cancer: Incidence, risks and diagnosis of simultaneous primary cancer in the opposite breast. Arch Gynecol 1985;237:85-91. Tousimis E. Synchronous bilateral invasive breast cancer. Breast Cancer Online 2005;8. De la Rochefordiere A, Asselain B, Scholl S, Campana F, Ucla L, Vilcoq JR, et al. Simultaneous bilateral breast carcinomas: A retrospective review of 149 cases. Int J Radiat Oncol Biol Phys 1994;30:35-41. Intra M, Rotmensz N, Viale G, Mariani L, Bonanni B, Mastropasqua MG, et al. Clinicopathologic characteristics of 143 patients with synchronous bilateral invasive breast carcinomas treated in a single institution. Cancer 2004;101:905-12. Pandis N, Teixeira M, Gerdes A, Limon J, Bardi G, Andersen J, et al. Chromosome abnormalities in bilateral breast carcinomas. Cancer 1995;76:250-8. Polednak AP. Bilateral synchronous breast cancer: A population- based study of characteristics, method of detection, and survival. Surgery 2003;133:383-9. Newman LA, Sahin AA, Cunningham JE, Bondy ML, Mirza NQ, Vlastos GS, et al. A case control study of unilateral and bilateral breast carcinoma patients. Cancer 2001;91:1845-53. Gollamudi SV, Gelman RS, Peiro G, Schneider LJ, Schnitt SJ, Recht A, et al. Breast conserving therapy for stage I-II synchronous bilateral breast carcinoma. Cancer 1997;79:1362-9. Heron DE, Komarnicky LT, Hyslop T, Schwartz GF, Mansfield CM. Bilateral breast carcinoma: Risk factors and outcomes for patients with synchronous and metachronous disease. Cancer 2000;88:2739-50. Cavaliere A, Bellezza G, Scheibel M, Vitali R, Sidoni A. Bio pathological profile of multiple synchronous homolateral and bilateral breast cancers. Pathol Res Pract 2004;200:9-12. Gong S primary synchronous bilateral breast cancer J, Rha SY, Jeung HC, Roh JK, Yang WI, Chung HC. Bilateral Breast Cancer: Differential Diagnosis Using Histological and Biological Parameters. Jpn J Clin Oncol 2007;37:487-92. Takahashi H, Watanabe K, Takahashi M, Toguchi K, Sasaki F, Todo S. The impact of bilateral breast cancer on the prognosis of breast cancer: A comparative study with unilateral breast cancer. Breast cancer 2005;12:196-202. Lesser ML, Rosen PP, Kinne DW. Multicentricity and bilaterality in invasive breast carcinoma. Surgery 1982;91:234-40.